Reimagining a favorite tune, whether one’s own or the work of another, is a time-honored practice that continues to this day. On Second Thought highlights a few 18th-century composers with a knack for cover tunes and remixes, including J.S. 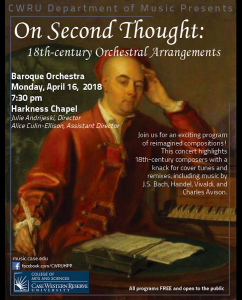 Bach who reassigned solo passages to keyboards rather than violins in his Concerto for Two Harpsichords, Charles Avison who turned one of Domenico Scarlatti’s fiery harpsichord sonatas into a full-blown orchestral concerto grosso, and G.F. Handel whose many arrangements and self-borrowings are legendary. Free and open to the public. Paid parking available in the Ford Ave. garage or at the meters along Bellflower Road and East Blvd.